Five Days of Celebrating Ramacandra! ~ The Toronto Hare Krishna Temple! Five Days of Celebrating Ramacandra! The great story of Ramacandra can be found in both the Ramayana and the Srimad Bhagavatam, two very revered scriptures. In those descriptions, one can read about how the citizens of Ayodhya, where Lord Ramacandra reigned as king, celebrated in grand fashion when He appeared. We can only imagine how grand those festivities must have been! 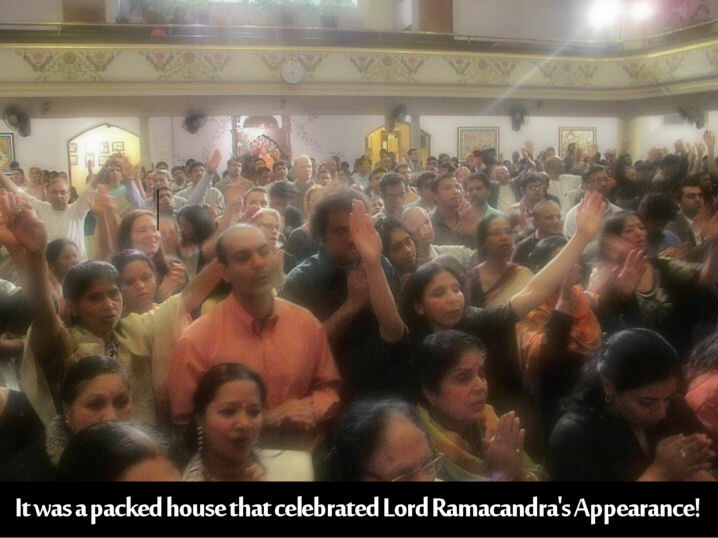 Well, Toronto's Hare Krishna Centre had our very own humble celebrations, compared to Ayodhya, in honour of the appearance of Lord Rama on His birthday... and by humble, we mean that we had five days of celebrations!!! It all began on Wednesday, March 24th, which was the actual day (as per lunar calendar calculations) that Lord Ramacandra appeared! Celebrations included wonderful kirtan, a class by Rupanuga das and more. One very interesting thing happened, though. During the festival, Laksmana, Lord Ramacandra's younger brother, magically appeared! He was in the middle of a battle with one of evil Ravana's demonic followers, Indrajit who suddenly appeared on the temple balcony! After an evil cackle, Indrajit shot an arrow and Laksmana fell unconscious!!! (For our unfamiliar blog readers, please do not be alarmed. This was simply a reenactment of the famous battle; nobody will shoot arrows at you if you visit our temple.) In the Ramayana, it is described that Hanuman then flew far away to retrieve herbs that eventually saved Laksmana! As some monkey warriors took the unconscious Laksmana off stage, it was announced that Hanuman would come to save him on Sunday, four days later! As festivities wound down after lots of kirtan, devotees sat in rows and created a "bridge" as they passed plates of prasadam to each other, just like how the monkeys built the bridge of boulders for Lord Rama! Between Wednesday and Sunday, devotees could watch the unconscious Laksmana via a live webcast feed on our blog! But there was a whole lot more happening during those days. For the first time, the Toronto Hare Krishna Centre hosted conference calls on each day with a theme of Rama-Lila. Mahatma das from Alachua, FL and Krsnanandini devi dasi from Cleveland, OH joined us for these calls and spoke about wonderful topics related to Lord Rama. During the calls, we hosted a chat window on our blog for teleconference attendees to interact with both the facilitators and each other. While there was a hint of a comedic element to the drama, the mood then certainly became meditative as an enrapturing Nama-Yajna then took place. In a Nama-Yajna, spiritualists collectively chant in a kirtan in an especially-meditative fashion! Led by Dhira Grahi das, the kirtan had the assembled devotees swimming in thoughts of Lord Ramacandra! After a rousing 8pm kirtan, devotees were then served a vegetarian feast by cardboard-crown-wearing servers who became Lord Rama's monkey army! 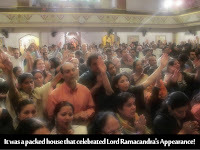 All in all, Toronto's Hare Krishna Centre presented five days of festivities to mark the appearance of Lord Ramacandra! We're positive that this paled in comparison to the celebrations that must have taken place in Ayodhya ages ago when Lord Rama actually appeared... but in our happy little way, we certainly seemed to bring the spirit of Ayodhya to Toronto! View the Festival Recording by Clicking Here. Click HERE for simple gallery!